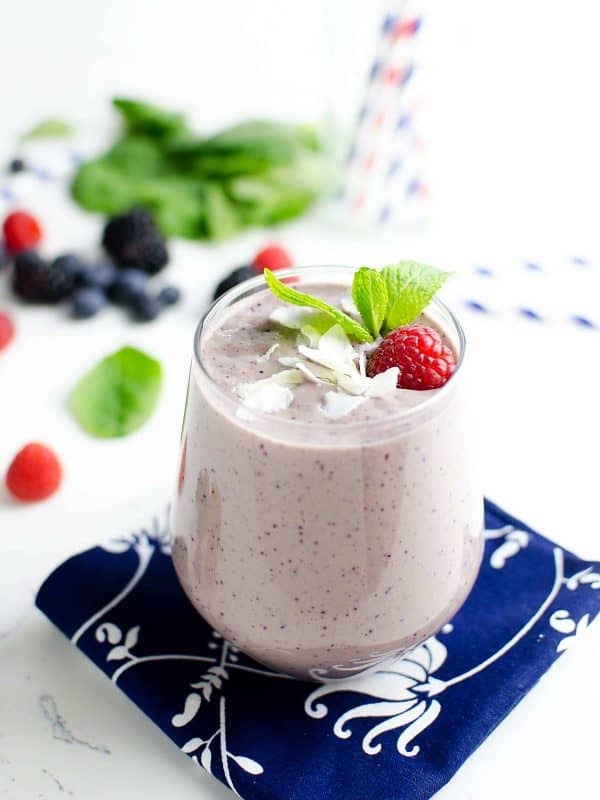 Packed with anti-oxidant berries, greek yogurt and spinach, this berry blast smoothie will start your day off right! Christmas is officially over and this is the week we’re finishing up those left over goodies, but in our mind we’re thinking– this madness has to stop! Berry Blast Smoothie to the rescue. Anyone else? Feeling a little thick? The New Year brings a a fresh start and a new mindset, and often people are making adjustments to their eating habits. But at our house Smoothies don’t happen just in January, nor do they happen just in the summer when the fruit is at it’s peak. Smoothies happen year round in my house. Breakfast, lunch, dinner, or snack, it’s always a good time for a smoothie! 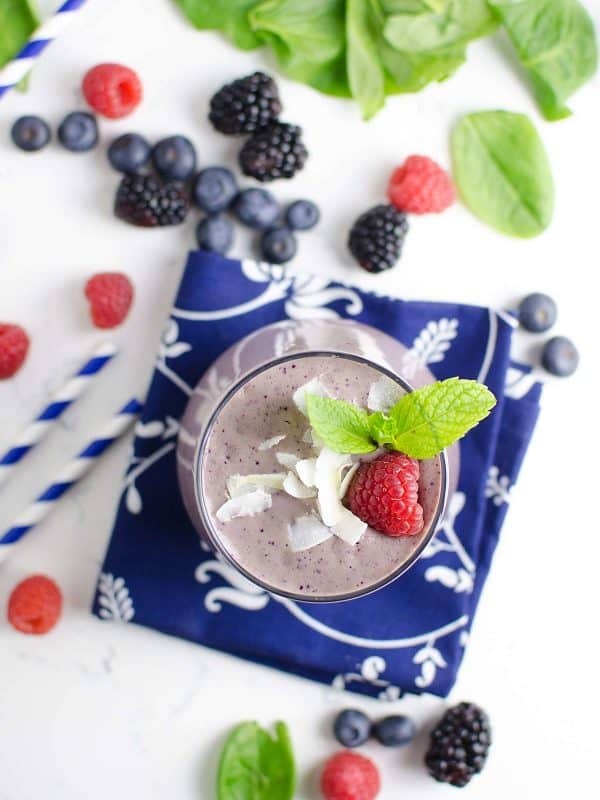 This triple berry smoothie is exactly what you need for a great tasting snack (or meal) and it’s loaded with nutrients. Okay, so we don’t typically have smoothies for dinner, but this one? You totally could! Truly any of my smoothies would be great for dinner, because I pack them full of good-for-you ingredients. But, as much as I love smoothies, I do like to eat my dinner, rather than drink it. Dessert though? For sure. I used to bribe my kids to eat their dinner by telling them we had dessert, which was actually a smoothie or fruit. I know, I’m so sneaky. LOL. They didn’t know it was healthy! It was sweet! I don’t need to bribe them anymore though, they are all fantastic eaters! They are eating me out of house and home, and they’re not even teenagers!!! As you know, berries are powerful superfoods. They are rich in nutrients and anti-oxidants. In addition to that, I’ve snuck some spinach in. What?! Spinach?! Yes! Spinach, also a superfood, is low in calories, is important in skin, hair, bone health, and provides protein, iron, vitamins, and minerals. And you won’t even taste it. 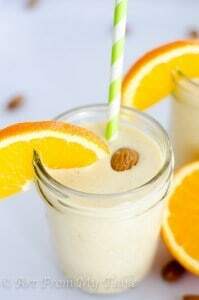 Even if you don’t care about all that health information, you will care how great this smoothie tastes! 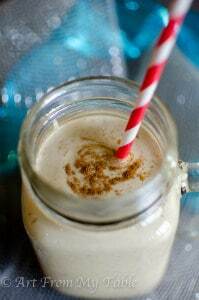 You can substitute your milk of choice (regular, coconut, etc). Sweeten with 100% pineapple juice (or just pineapple) instead of sugar. You can use frozen fruit instead of fresh, just eliminate the ice cubes. Use more milk if you like a thinner smoothie, less for a thicker one. This also depends on how much of your fruit is fresh or frozen. 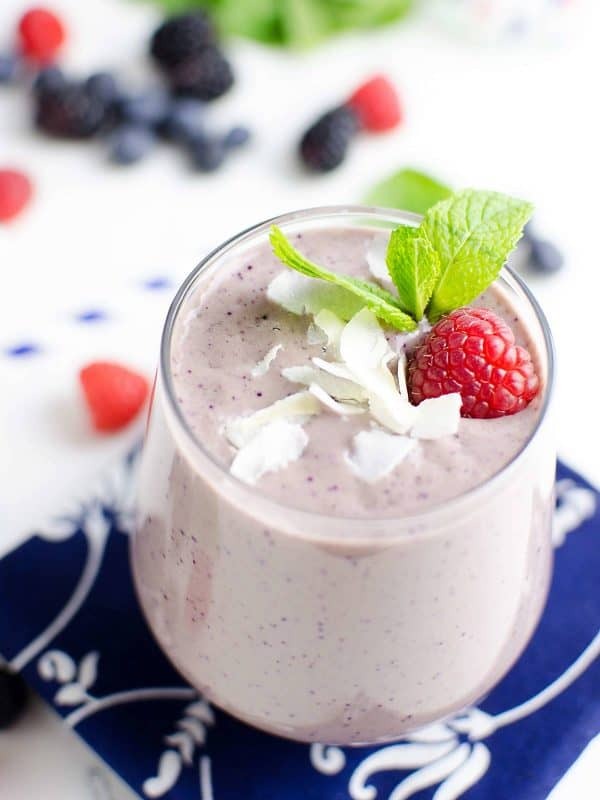 Super charge your day with this delicious berry blast smoothie filled with anti-oxidants and packed with protein. 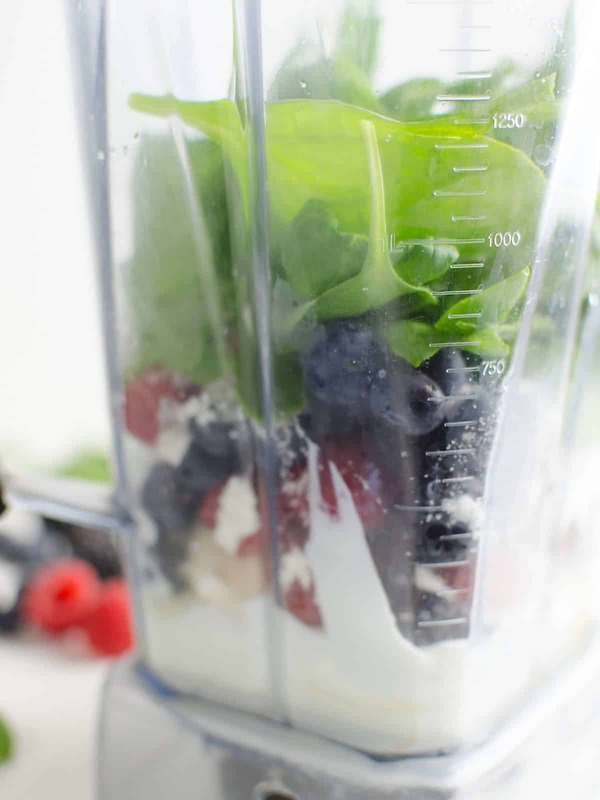 Add all ingredients in order to the blender. Frozen fruit may be substituted for fresh fruit, just eliminate the ice cubes. Substitute your choice of milk for the almond milk (regular, coconut, etc). Love smoothies? 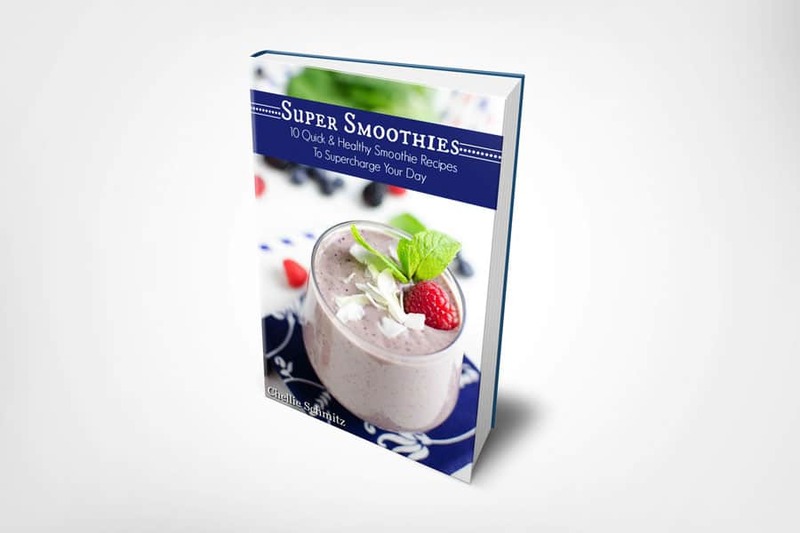 Grab my Super Smoothies Cookbook! Click on the image! Grab your super smoothie book here! Ha! That’s funny. You’ll love it. 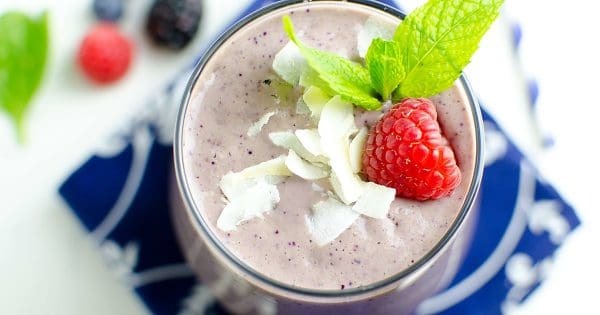 I love berries and I love smoothies so obviously I love this recipe. I also did not realize that Burt’s Bees made protein drinks, so I appreciated learning about that from the ad on your site. Thanks for sharing at Friday Feature Linky Party. Thanks Amy. I love this one because it just tastes so much like a fruity dessert, but you still sneak your greens in. Enjoy!